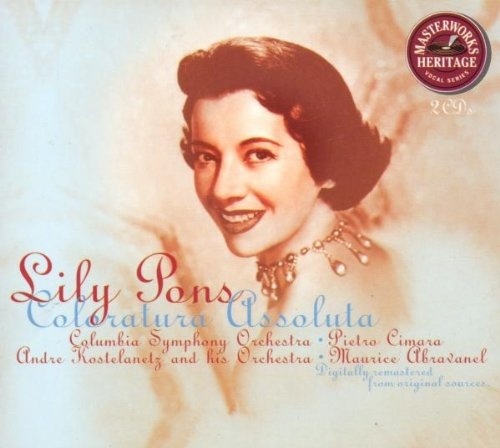 Lily Pons was a miraculous soprano coloratura, and this two-CD set pays exquisite homage to her vast artistic gifts. The informative, beautifully-designed liner notes tell the story of Pons' rise to fame and of her association with conductor (and one-time husband) André Kostelanetz. The tracks were recorded during the 1940's at the height of Pons' artistic powers and celebrity. Thoughtfully re-mastered, each selection is a jewel. Pons produces notes that seem to come from the heavens, heard most remarkably in her "Caro nome" from 'Rigoletto' and Olympia's aria from 'Les Contes d'Hoffmann.' Never sounding like a robot or a mere technician, she brings her effervescent personality to each work in these recordings. In addition to arias from the operas Pons regularly performed in repertory at the Met, the set includes other composer's works (Milhaud, Rimsky-Korsakov, and Bishop), all artfully executed. Pons lived during a time when opera singers were viewed as movie stars with great voices to boot. Her star-quality shines through on these discs, and one hopes that such a presence will emerge again in modern times. Pourquoi dans les grands bois?